The dominant tradition within Christianity holds that Judas Iscariot betrayed Jesus by delivering him to the chief priests, but lesser traditions hold that Judas provided a service by delivering him. One of those lesser traditions, one which dates back at least to the second century, holds that Jesus instructed Judas to deliver him ; and Judas, like a servant, did as he was instructed. The seeker of truth might wonder, was Judas a betrayer or a servant? The answer is, “He was both.” The question reflects a false dichotomy. The dominant tradition holds that the betrayal extended over time from when Judas made a covenant to deliver Jesus until when Judas kissed him to identify him to the arresting officers. It fails to perceive the successful intervention into the betrayal made by Jesus when he washed the feet of his disciples. Jesus aborted the betrayal when he washed the heel which had been lifted up against him. Subsequently, Judas acted in service to Jesus. The dominant tradition mistakes an act of service to Jesus, the act of delivering him, for an act of betrayal. The dominant tradition mistakes a kiss of love for a kiss of betrayal. “STEPS” related to the betrayal are presented below. Steps 3 and 4 describe the betrayal of Jesus. Steps 7 and 8 describe the service to Jesus. The desire to hurt back at someone who causes hurt to us is of the devil, and the adoption of this course of action by Judas is so described at step 2. At step 4, Judas continues upon the evil path that he has chosen. Jesus aborts the betrayal at step 5. The foot washing is an artifice used by Jesus to tell Judas his fault and to convey his message of forgiveness for the betrayal. By this response to the betrayal, Jesus gains his brother, and the desire to hurt back at Jesus is cleansed from Judas. Judas accepts the assignment at step 7. Judas overcomes Satan, who has entered into him (John 13:27) and who is opposed, as Jesus taught, to the things that be of God. (Matthew 16:21-23) Judas experiences Satan as his (Judas') own opposition to the delivering of Jesus, but he recalls the instruction that Jesus gave when Simon Peter opposed the things which Jesus said must happen at Jerusalem, “If any man will come after me, let him deny himself, and take up his cross, and follow me.” (Matthew 16:24) Judas realizes that the covenant that he made with the chief priests has become his cross. Judas denies himself and takes up his cross. 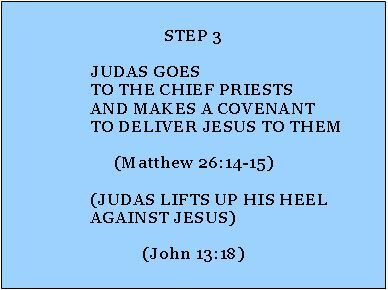 Judas completes his assignment at step 8. In summary, Judas Iscariot betrayed Jesus after the devil put into his heart to deliver him to the chief priests. Subsequently, Jesus effected a change of heart within Judas by his response to the betrayal. Then, Judas served Jesus when Jesus put into his heart to deliver him.